Stand in the centre of Arts Square in Saint Petersburg, next to the statue of Russian poet Alexander Pushkin, and you’ll find yourself surrounded by the whispers of history. The grand buildings that circle the square tell myriad tales of Russian life, from the Imperial era of Tsar Nicholas I and the post-Revolution years of the early 20th century, to the modern day, when the city stands at the crossroads of east and west. On the northern side, the neoclassical Mikhailovsky Palace, designed by Italian architect Carlo Rossi, is now home to the Russian State Museum: a trove of Russian artistic treasures spanning almost 900 years, and the largest collection of Russian fine art in the world. On the western side is the Mikhailovsky Theatre, one of Russia’s oldest, where the great works from Russian, French and German masters have been performed for the city’s cultured inhabitants since its curtain first rose in 1833. The building that occupies much of the south side of the square is one of Saint Petersburg’s most fabled; one also created by Carlo Rossi after splicing together three existing townhouses behind one impressive façade. 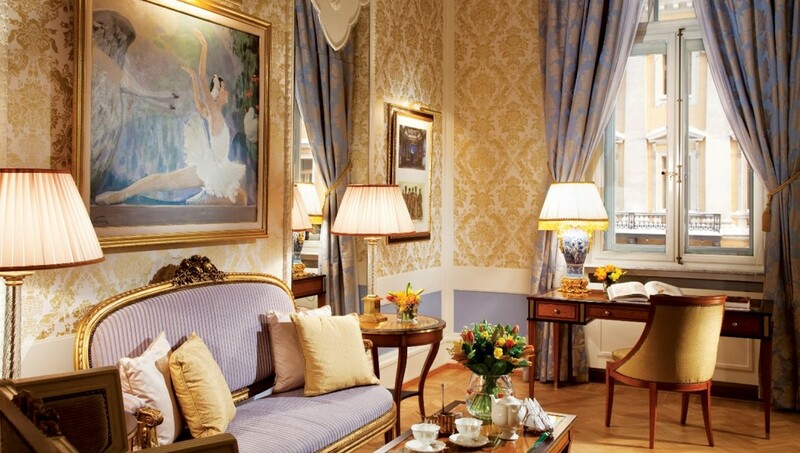 Belmond Grand Hotel Europe is the grande dame of Saint Petersburg; a historic property that has welcomed more heads of state, VIPs, royal families and high profile celebrities than any other else in town during its 144-year history. Running the length of Mikhailovsky Street, connecting Arts Square with the three-mile long Nevsky Prospect, the hotel finds itself in good company. A few blocks north, you’ll find the Church of the Saviour on Spilled Blood, the onion-domed edifice built on the spot where Emperor Alexander II was assassinated in 1881. To the east is Shuvalov Palace, now home to the Fabergé Museum, where 15 magnificent Imperial Easter eggs are among the highlights of the incredible collection, bought from US publisher Malcolm Forbes after his death in 1990. It is to this particular attraction that hotel guests are inevitably drawn after checking into the Fabergé Suite, one of 10 historic suites that occupy the first floor of Belmond Grand Hotel Europe. Entering the fabulous abode is indeed like walking into a museum. The surroundings are rich and antique; the decoration dedicated to the master jeweller Peter Carl Fabergé. Like many of the most impressive works produced by the House of Fabergé during its halcyon years of the late 19th century, the suite dazzles with a burst of bright colours set on a golden backdrop: pink and purple upholstery that pops against gilded classical-style furniture. Heavy embroidered drapes hang from the double height ceiling, shutting out the cold Saint Petersburg weather. Underfoot, there’s a rich hand-woven rug with detail so fine, it resembles the delicate filigree work of Fabergé’s most intricate pieces. Colourful porcelain ornaments further embellish the bright palette, while portraits of the man and his works are hung on golden damask walls. The whole scene is set to the soundtrack of Tchaikovsky’s most enduring ballet, The Nutcracker, which fills the rarefied air courtesy of a Bose sound system. The bedroom inspires a calmer mood, but the golden walls, mirrored panels and warm parquet flooring exude a sense of understated luxury. 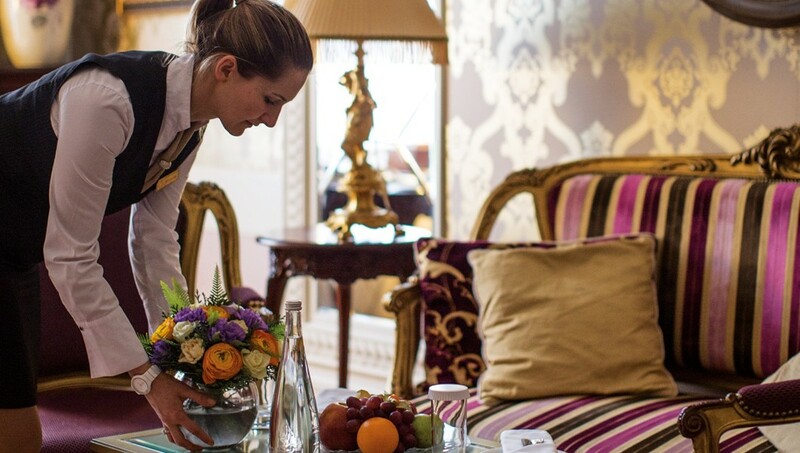 Like the affluent households of 19th century Saint Petersburg, guests staying in the Fabergé Suite have a butler on call at all times, who’s there to help with restaurant bookings, breakfast coffee and other housekeeping matters. 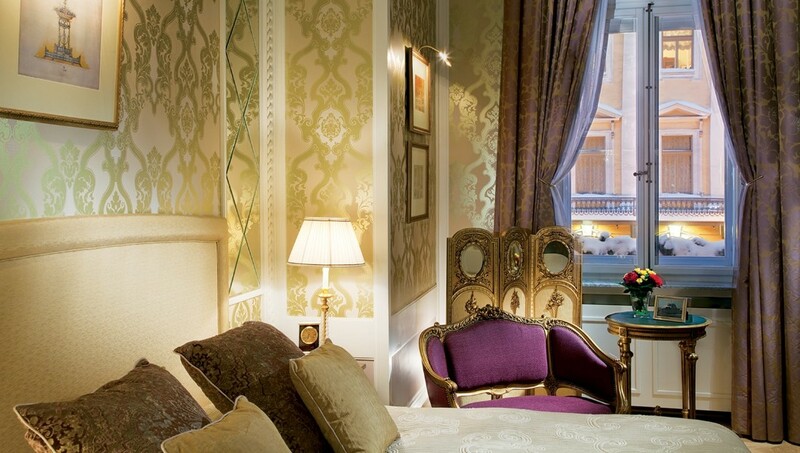 Among the other historic suites created by French designer Michel Jouannet, several stand out. The Dostoevsky Suite, named after regular guest and ‘Notes From the Underground’ author Fyodor Dostoevsky, commands superb views of Arts Square, with an ample writing desk in the corner living room and a bathroom finished in contrasting marbles: two of the 30 varieties of marble used throughout the hotel. The Lidval Suite was created in honour of architect Fyodor Lidval, who oversaw a major refurbishment of the hotel between 1908 and 1914. During the transformation, he overlaid his ornate Art Nouveau style on the Lobby Bar and Krysha Ballroom, as well as the main stairway leading up to the Historic Floor. The Rossi Suite is dedicated to the man who created the hotel’s iconic façade, while the focal point of The Stravinski Suite is a glossy black grand piano: one of six in the hotel. None are quite as magnificent as the Lichtenthal grand piano: a museum-worthy piece inlaid with obsessively intricate birds and flowers, made by Belgian master Herman Lichtental. The antique instrument’s ivory keys have been coaxed into life by the likes of Tchaikovsky, Strauss, Prokofiev and Shostakovich over the decades: all of who have stayed at the Grand. Luciano Pavarotti practised on another piano during his stay in 2014, and Elton John famously entertained guests here during a Russian tour in 1979. 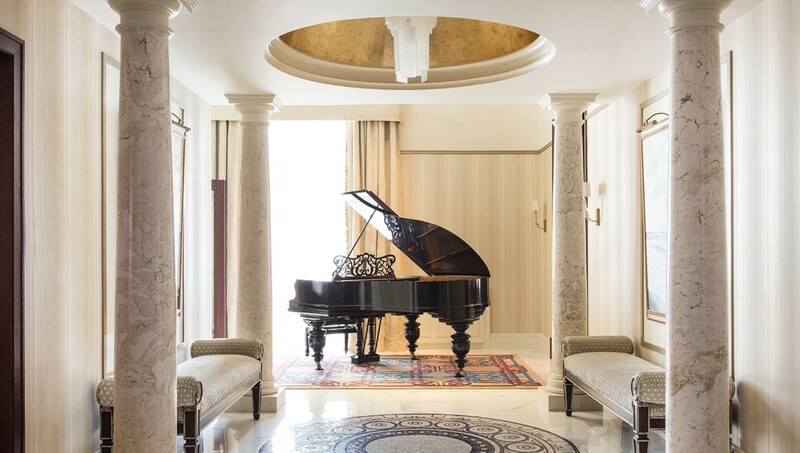 Music remains an integral part of the hotel experience, from the solo pianist who performs at breakfast beneath a stained glass window in L’Europe (which turns into one of the city’s most beloved fine dining restaurants in the evening) to the nightly jazz at the extremely elegant Lobby Bar. Dining takes a contemporary twist at Azia, where chef Larissa Kordik prepares modern, pan-Asian cuisine in a sleek, modish venue created by Japanese design firm Super Potato. 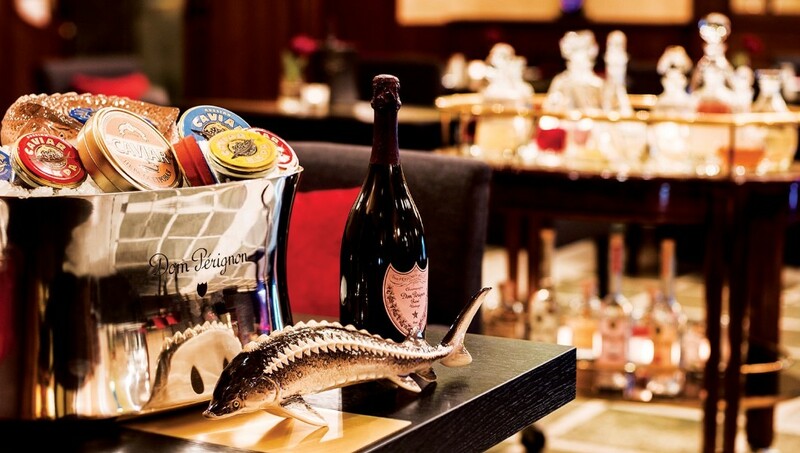 The strains of classical guitar and violin also accompany an evening at the Caviar Bar & Restaurant, an essential destination for anyone visiting Russia for the first time. Start with a selection of regional caviars (beluga, oscietra, sterlet and salmon, to name a few) paired with Russian vodkas, both distilled and traditional varieties, and marvel at how the potent spirit cuts through the unctuous roe. Follow with a selection from the main menu, which combines classical and contemporary Russian dishes: try the country rabbit blinis with a rich cherry sauce, followed by a deconstructed beef Stroganov, a modern take on a traditional Russian dish. Don’t miss the opportunity to try some surprisingly good Russian wines: the sparkling white Temelion, made from chardonnay and pinot noir grapes in the northern Caucasus, is exceptional. Beyond Arts Square, there’s a whole city of architectural marvels and cultural riches to be discovered in Saint Petersburg, and Belmond Grand Hotel Europe is well positioned to visit all of them on foot. The imposing Kazan Cathedral is just around the corner, and the extraordinary State Hermitage Museum and its unfathomable collection of treasures is a short walk away. Exploring them all takes time and stamina, but returning to the comfort of the Fabergé Suite means you’ll experience a taste of the Imperial lifestyle that has been so carefully preserved at this legendary hotel.